Decades of work have shown that trace- to minor-amounts of hydrous components commonly occur in minerals whose chemical formula would be normally written without any hydrogen, namely, the nominally anhydrous minerals (NAMs). When the concentrations of the hydrous components are several tenths of a percent by weight or higher, a variety of analytical methods such as weight loss on heating, X-ray cell parameters, X-ray structure refinement, Karl-Fischer titrations, or even careful electron microprobe analyses can be used to establish their concentrations (e.g. Aines and Rossman, 1991). However, for most NAMs, accurate determinations with these common analytical methods prove difficult if not impossible. For this reason, infrared (IR) spectroscopy has become, and remains, the most widely used method to detect and analyze hydrous components (OH or H2O) in minerals and glasses because it is both highly sensitive and can be done rapidly with a commonly available, modestly priced instrument and at dimensions of just a few tens of micrometers. A change in the electric dipole occurs when the OH bond in either water and hydroxyl ions vibrate. This motion has a resonance coupling with electromagnetic radiation generally in the 3500 cm-1 region of the infrared spectrum. In addition, bending motions of the water molecule, and overtones and combination of these motions produce absorption in the infrared. Under favorable conditions, namely a sharp band in a single orientation, just a few nanometers equivalent thickness of a hydroxyl species such as an amphibole can be detected in an otherwise anhydrous mineral such a pyroxene (Skogby et al. 1990). Routinely, detection limits of a few to tens of ppm wt of H2O in a mineral can be detected and often quantitatively determined. The overtone and combination modes of OH and H2O behave in predictable fashion in minerals (Rossman 1975) so that the two species can usually be separated from each other. 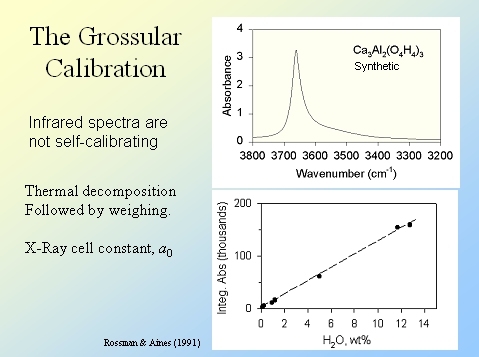 Infrared spectra, however easily obtained, are not rigorously self-calibrating, so independent methods of analysis have been necessary to calibrate the spectroscopic work. A couple general correlations of IR band intensity with the absorption energy have proven useful, if approximate. Various absolute hydrogen extraction methods have proven highly useful for purpose of rigorous calibration. 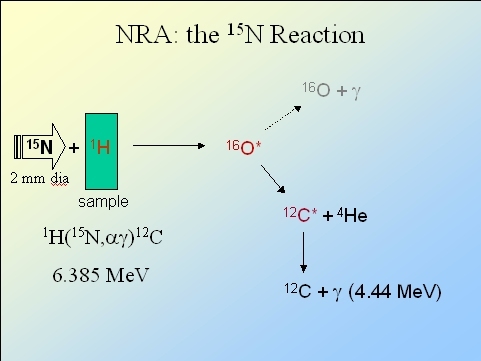 More recently, nuclear methods that rely upon specific resonant reactions with the hydrogen nucleus or nuclear scattering specific to hydrogen have gained importance and have provided critical absolute calibrations of the infrared spectra. Secondary Ion Mass Spectroscopy (SIMS) for hydrogen is still in the early stages of development but once calibrated, and with established protocols, should play an ever-expanding role in the future. NanoSIMS promises to bring hydrogen analyses to ever finer spatial dimensions but will require significant effort before it can be regarded as an accurate analytical technique for small concentrations of hydrogen. The purpose of this chapter is to review the various methods that have been used to analyze hydrous components in the NAMs.